British film director Peter Greenaway said that the release of Last Year at Marienbad “is comparable with the revolution of non-figurative art in painting”. It has constantly influenced directors and, at the same time, is considered one of the most boring films ever made. Directed by Alain Resnais and released in 1961, Last Year at Marienbad represents a fundamental turning point in the history of cinema and is essential in the discussion about the transition from modernity to postmodernity in literature, philosophy, cinema and architecture. A. Delphine Seyrig; X. Giorgio Albertazzi; 10. Statue and balaustrade mounted on a pensile stage and built for the set in Nymphenburg Park; 11. Nymphenburg Park, western side; 14. Schleissheim New Palace, eastern facade. Last Year at Marienbad is the “story of a persuasion”, as Alain Robbe-Grillet, the screenplay author, puts it. A man, X (played by Giorgio Albertazzi), tries to persuade a woman, A (Delphine Seyrig) that they’d met somewhere the year before and had an affair. But the woman doesn’t remember and denies they’d met. The story also includes a third person, M (Sacha Pitoëff), who may or may not be the woman’s husband. Until that time, it was common to conceive cinema as a sort of illustrated version of published novels. This is, for example, the case in Alfred Hitchcock’s films, whose narrative structure develops in a pyramidal way, starting with a multitude of possibilities to solve a mystery, while gradually reducing them to only one. The reference to the British director is suggested by the presence of a cut-out of Hitchcock in the opening scenes of the film, placed slightly hidden in the shadow of a corridor while the narrator’s voice says “Did you see yourself?”. Resnais intended to fully develop the potential of cinema as an autonomous art when he directed Last Year at Marienbad, a screenplay which in itself searched for ways to break with the aesthetics of the traditional novel. The fragmented narrative structure of the film introduces an ambiguous reality where temporal and spatial references are constantly shifted and not localized; traditional rules of chronological order and causality are missing, confusing and disorienting the audience. Therefore, Last Year at Marienbad demands the viewer’s total dedication, leaving them with “a margin of imagination”, as Resnais and Robbe-Grillet openly declared. Last Year at Marienbad’s innovation lies not only in the disrupted linearity of the narrative, but also in the way Resnais used and manipulated architectural space in order to translate this into a visual form, breaking free of pre-established conventions of building narratives in cinema. The film takes place in a baroque hotel, which is in fact an imaginary building created by editing scenes shot in several locations — namely three royal palaces in Munich and a film studio in Paris. The hotel can be considered a ‘Frankenstein’ location, a mix of different buildings, which appears to the spectator as one. It is literally a re-composition of various building fragments. Rather than using these different locations purely for logistics during filming, Resnais uses them to structure the filmic space so that it is not revealed in a linear way, but to result in a slow process of discovery by a disoriented viewer. Interpretative plan of the film location: 1. Hall of Mirrors, Amalienburg hunting lodge in the grounds of Nymphenburg Palace, Munich; 2. Vestibule, Schleissheim New Palace, Munich; 3. Great Hall, Schleissheim New Palace; 4. Grand Staircase, Schleissheim New Palace; 5. Movie studio, Paris; 6. Antiquarium, Royal Palace, Munich; 7. Loggia, Schleissheim New Palace; 8. Great Hall, Nymphenburg Palace; 9. Grand Staircase, Nymphenburg Palace; 10. Statue and balaustrade mounted on a pensile stage and built for the set in Nymphenburg Park; 11. Nymphenburg Park, western side; 12. The Pool of Flora, Nymphenburg Park; 13. Schleissheim Park, Parterre between Old and New Palace. The hotel becomes a fantastic, labyrinthine space where memory and imagination become one. This process of alteration of reality is carefully planned by Resnais and realized through specific film-editing and camera moves. For instance, the room where A is hosted has initially little furniture and is extremely bright, but later appears with more and more decoration and furniture, assuming the image of a real hotel room more closely. Also, movable walls were used to expand the size of the room. The transformation of the room is a physical translation of A’s mental state as she probably starts to remember the affair with X, shifting from delirium to the awareness of reality. In fact, the whole space of the hotel can be read in relation to the psychoanalytical aspects of the story. In September 1961, during an interview for the magazine Cahiers du cinema, Resnais explained that the large rooms in the hotels “indicate the tendency to narcissism”. Furthermore, he compared the ambiguity of the hotel space with a mental hospital. This interpretative key directly depends on the characteristic of the space and the behaviour of the characters. In light of this, the Hall of Mirrors of the hotel, shot in the late baroque Amalienburg Pavilion in Munich, echoes Sigmund Freud’s studio, where a mirror hung on the window alternatively reflected him and his patient during the therapeutic encounters. Moreover, the monumentality of the hotel may represent the figurative obstacles of mind and the feeling of isolation. This is emphasized by the repetitive monologue: “[…] endless corridors, silent deserted corridors, […] transverse corridors that open in turn on empty salons, rooms overloaded with an ornamentation from another century, silent halls…” Even the costumes, which can be considered part of the architecture of the hotel, follow the emotional engagement of the characters. X wears the same suit throughout the film, as his attitude never changes. Meanwhile, A alternates between black and white dresses, emphasizing her emotional instability. The tension between X and A can also be read as the relationship between a psychoanalyst and his patient: the psychoanalyst confronts the patient’s defence and resistance, bringing out repressed and unconscious inner conflicts which have caused the character’s problems. The topic of the ‘modern’ treatment of madness present in the early 1960s, and it is no coincidence that Michel Foucault published the book Madness and Civilization, influenced by his working experience in a mental hospital, in the same year 1961. However, Last Year at Marienbad doesn’t only reflect the preoccupations of the 1960s; it is a film that is still relevant today, since it takes place in an undefined time, an eternal present that the spectator lives for one and half hours. The film engages the audience emotionally but not through acting. Inspired by his favourite comic Mandrake, Resnais instructed the actors to make use of rigid and artificial postures, requesting Giorgio Albertazzi (X) to perform without blinking. It is through architecture that Resnais expresses emotions. 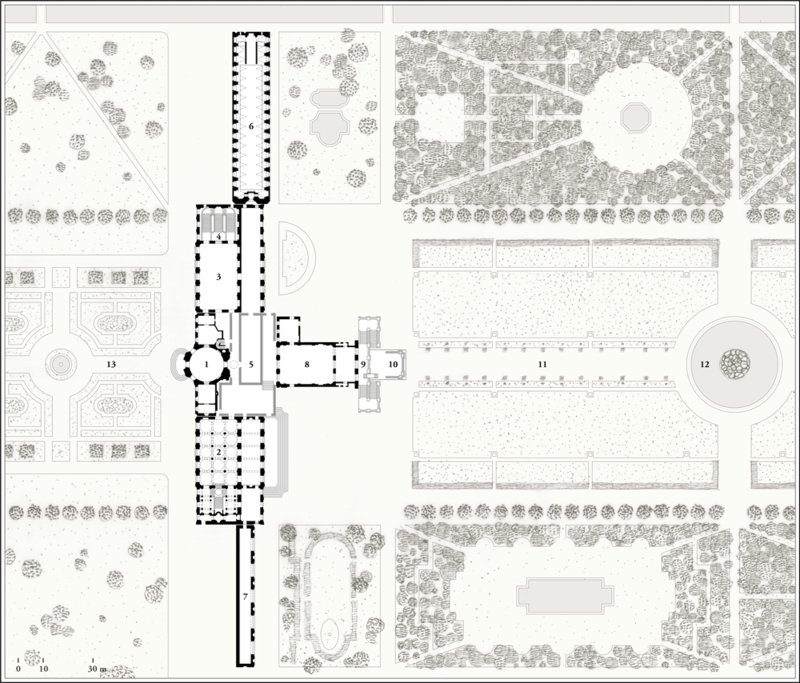 The architectural space created in Last Year at Marienbad acts as a device to deconstruct the logic of reality and stimulate the unconscious in the mind of the viewer. By watching the film, one is engaged in a retroactive reconstruction of Alain Resnais’ mental spatial configurations in his dual role of director and “architect”. Renzo Sgolacchia is a Rotterdam-based architect and a co-founder of the collective OMERO. He is the promoter of the project Cinema Architecture that consists of a series of film screenings supported by seminars and debates. The goal is to investigate new modes of perceiving, representing, and conceiving architecture through the visual experience of cinema. A new series called Itinerant Movies will start in November at KINO Rotterdam. The intention is to show only films shot entirely in a single vehicle. By that, each film can be seen as a specific vector that describes trajectories and movements marked through a Cartesian coordinate system or simply a map. With their deliberate visual restriction, the narrative of single-set films depends on the tension between the inside (vehicle) and the outside space (landscape).